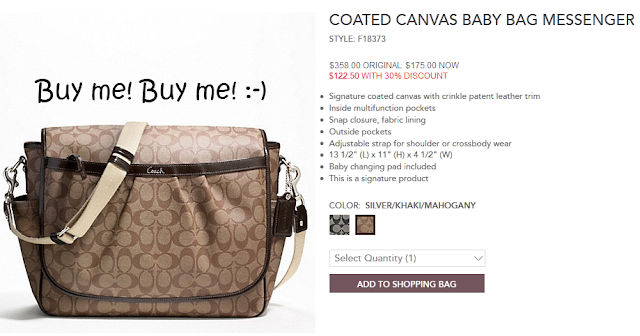 Home baby Coach deal diaper bag fashion invite leather products Coach...as a Baby Diaper Bag??! 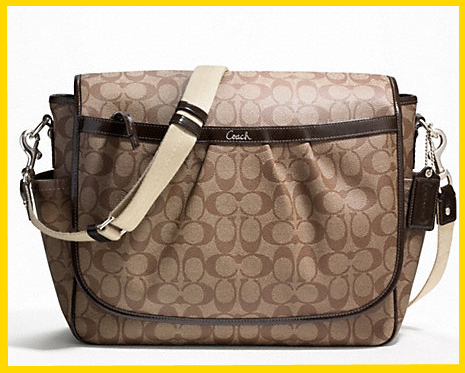 Coach...as a Baby Diaper Bag??! Miss Frugal has had a momentary lapse of judgment. Normally I would frown at a baby bag bearing a price tag of $100 plus. However, I could not let this deal get away. Or at least not mention it to my mother and have her quickly purchase it for her little princess. Thanks, Mom! It's the only high-priced item for baby so far. Everything else is used. It's my birthday soon. Happy birthday. I like that there are a lot of compartments inside of the bag. This is great for me because I will most likely put my personal items in the bag too. It will double as a diaper bag and purse. I also do not have to worry about it getting dirty. The leather will be easy to wipe off. I will say that the side pockets are a bit tight. I was expecting to put a bottle in there, but it looks like I'll have to settle for other smaller items. I guess this would be my only complaint. For one more day, you can own this bag. I'll have you know it was originally $358, marked down to $175 and now with an additional 30% off to bring it to $122.50. This bag also comes in black leather as well. There are a few other styles that can double as a baby/diaper bag. You can find this bag on the Coach Factory website, where prices can be ridiculously low. It's invite only. So, if you need an invite, just let me know by shooting me a quick email . All I need is your e-mail address. So, what do you think? Is this too much for a diaper bag?